Alpha-0 Dünir Dünheim dungeon design by Michael Bacon. Alpha-0 dungeon design by Javier Perez. 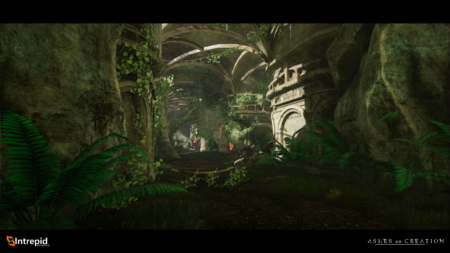 Dungeons in Ashes of Creation will range in size and will be mostly open-world. 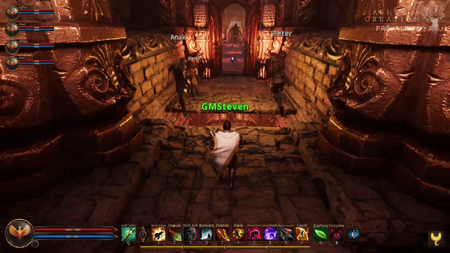 Open world dungeons will be populated to facilitate multiple groups within the dungeon. Instanced dungeons will also be present and will cater for solo and group questlines. Ashes of Creation will be a seamless open-world experience. No loading time or loading screens between regions. There will be open world dungeons and raids. The aspiration is to maintain the open world feel while being able to capitalize on the benefits of instanced mechanics. Instancing is only going to happen in certain dungeons where the desire is to have greater narrative appeal. Outside of these and arenas there will not be too much instancing anywhere else. The PvP flagging system presents an opportunity for open conflict. The intention is that dungeons are going to be "massive" in scale. Massive caverns and open world spaces. Places to suit larger and smaller commitments. Where people with 30 minutes can participate. Dungeons are vast and have room for multiple groups. New points of interest (such as dungeons and world bosses) spawn as nodes develop. This content adapts to the development of the zone it is in. The content may be different altogether, depending on what is developed and how. Different types of antagonists with different story lines. 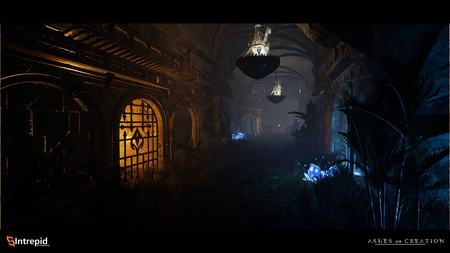 Some dungeons will only be unlocked if nodes are developed to certain stages. 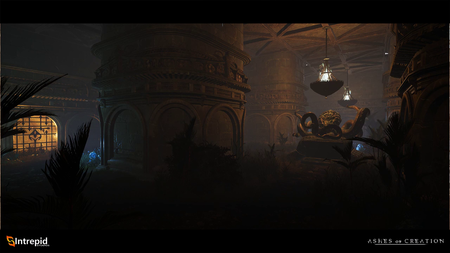 Storyline objectives for players inside dungeons will depend on the story arc paths chosen through the node system. Drop tables in areas and dungeons will be tied into the progression of certain areas. Certain dungeons and other points of interest across the map will all be affected by the server’s node development. 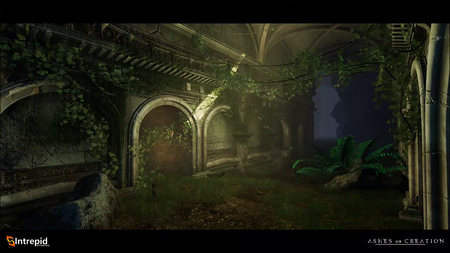 Some dungeons will only be unlocked if nodes are developed to certain stages. The storyline objectives for players inside dungeons will also be dependent on the story arc paths chosen through the node system. The drop tables in area and dungeons will also be tied into the progression of certain areas. 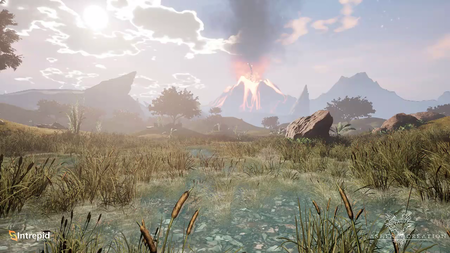 For example, let’s say that the humans have developed a node in Region A, and a storyline has opened up that leads players to inspect the ruins (dungeon) of a nearby area. And let’s say that this node was developed in a scientific (crafting) zone… Well before the node developed, this dungeon was accessible… But now the dungeon has propagated new monster assets that include a drop table catering to a crafting emphasis because of the development of that scientific node. And perhaps, a new boss appears in different rooms of the dungeon that includes different adventure quest starts, like a mysterious item with a storyline that can only be progressed if a node develops to the metropolis stage in a certain region, across the world. Our system is so vast, when it comes to interconnectivity and how the world reacts to the players. Raids will have elements that can be pre-planned. Required composition of DPS, healers and support. Raids will also have dynamic elements that can change from session to session. The types and numbers of bosses and mobs present in the raid and their skill repertoire. Variables are manifested based on node progression. The number of metropolis nodes developed. The types of metropolis nodes developed. Ashes of Creation is designed for solo players as well as large and small groups. The party size is eight (8) players for a single group. Raids will have 40 man groups. Content will be tailored for 40, 16 and 8 person group sizes. Arenas will have 1 man, 3 man, 5 man and possibly 20 man Free-For-All (Deathmatch) group sizes. There won't specifically be guild vs guild arenas but team-based matchmaking allows teams to face other teams. Castle sieges are expected to have at minimum 250x250 players to be on a single battlefield, with the possibility of increasing this to 500x500 over time. Content isn't locked behind guilds. Mechanics exist within larger conflicts for small groups and even solo players to impact the battle. This includes systems that will likely focus on single group sized participants while the larger battle is occurring. Group sizes in Ashes of Creation Apocalypse. Ashes of Creation Apocalypse battle royale will have party sizes of up to 5. Guild mode will have parties of raids of up to 20. 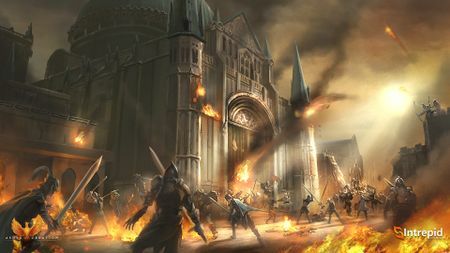 Ashes of Creation Apocalypse castle sieges will have parties of 5 within a raid, with 5 raids for each of the two teams. Ashes of Creation Apocalypse horde mode will have a party size of 5 with a total of ten groups, making for 50 players. Mobs and Bosses will drop Gold, Items and crafting materials based on the type of mob or boss. For example, a wolf is not going to be carrying a sack of gold. It may instead drop "pelts" that can be traded for gold. Loot tables will favor dropping crafting materials as opposed to trash items. Loot tables are disabled for player controlled monsters. The developers intend to test dynamic loot tables during the test phases. Underwater dungeons are part of Ashes of Creation naval content. For every play, there should be a counterplay. We often see Castle Sieges turn into zerg-fests, which really doesn’t capture the epic, back-and-forth battles we wish to see in Ashes of Creation. One of our key pillars is that Choice Matters, and that applies to tactics and strategy as well. A well-formulated battle plan should win out over stat sheets and bodies. Zergs will generally be difficult to pull off, and will be eminently counterable through siege weapons, traps, and other battlefield tricks. Zergs are empowered by fast-travel. Meaningful travel times are intended to prevent zerg play from being so much of an influence. Encounters are designed to have meaning in terms of how boss skills and abilities relate to group compositions, tactics and strategies. Zerging is not experiencing content. Raid and dungeon bosses have specific mechanics that players need to learn and react to. Zergs that are not aware of these mechanics or react to them appropriately will be wiped. There is a give-and-take for guilds that want to see a larger number of members as opposed to a more focused group that may be a part of an alliance. Mechanics that encourage political intrigue will play a role in destabilizing zergs. Having objectives in gameplay make helps to balance the zerg mentality. There will be dungeon and raid leader boards. Some leader boards will be across all servers. Jumping over a pit trap in Alpha-0 Dünheim dungeon. Jumping puzzles will occasionally feature in the world. 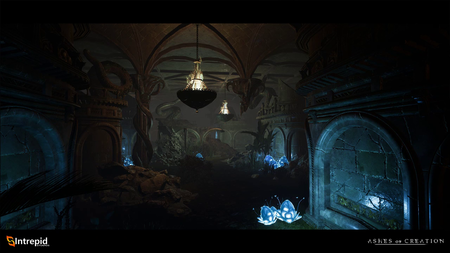 Jumping mechanics are present in the Alpha-0 Dünheim dungeon. There will be global (server-wide) announcements/notifications of important events. Local node events, such as Caravans will not be announced. These will rely on player word-of-mouth. There will be a mentorship program where upper-level players are able to benefit from partying and/or helping lower level players; and getting them situated in the game. Levels or skills will not be adjusted to allow low level players to participate in dungeons with higher level players. ↑ Livestream, 18 January 2018 (16:34). ↑ Livestream, 9 February 2018 (4:42). ↑ 3.0 3.1 3.2 3.3 3.4 Livestream, 17 November 2017 (17:50). ↑ 4.0 4.1 Livestream, 1 June 2017 (39:21). ↑ 5.0 5.1 5.2 5.3 Livestream, 22 May 2017 (20:59). ↑ 6.0 6.1 6.2 Livestream, 27 September 2018 (43:21). ↑ Livestream, 16 October 2017 (11:51). ↑ Livestream, 19 May 2017 (24:17). ↑ 10.0 10.1 10.2 Livestream, 19 May 2017 (23:00). ↑ Livestream, 9 February 2018 (45:30). ↑ Livestream, 17 November 2017 (36:22). ↑ 13.0 13.1 13.2 13.3 13.4 Livestream, 17 November 2017 (18:29). ↑ 15.0 15.1 15.2 15.3 15.4 15.5 Podcast, 9 July 2018 (22:24). ↑ Livestream, 9 May 2017 (34:38). ↑ 19.0 19.1 February 8, 2019 - Questions and Answers. ↑ Livestream, 26 May 2017 (48:12). ↑ Livestream, 8 May 2017 (28:48). ↑ 25.0 25.1 25.2 25.3 25.4 25.5 Interview, 17 August 2018 (18:53). ↑ 26.0 26.1 Livestream, 24 May 2017 (44:14). ↑ Livestream, 3 May 2017 (35:25). ↑ Livestream, 17 May 2017 (30:53). ↑ Blog: 10 facts about castle sieges in the MMORPG. ↑ Livestream, 19 May 2017 (25:18). ↑ 33.0 33.1 Livestream, 22 May 2017 (57:37). ↑ 34.0 34.1 Interview, 11 May 2018 (44:20). ↑ 35.0 35.1 Interview, 8 August 2018 (11:52). ↑ Livestream, 18 July 2017 (58:50). ↑ Livestream, 15 May 2017 (44:10). ↑ 38.0 38.1 Livestream, 9 February 2018 (10:42). ↑ Livestream, 28 July 2017 (39:49). ↑ 40.0 40.1 40.2 40.3 40.4 Livestream, 4 May 2018 (48:14). ↑ 41.0 41.1 41.2 Interview, 17 August 2018 (24:48). ↑ 42.0 42.1 Video, 5 April 2018 (40:08). ↑ Interview, 24 August 2018 (8:52). This page's content was last modified on 14 March 2019, at 14:50.